In Leaving Microsoft to Change the World, John Wood recounted the story of how a hiking trip through Nepal resulted in his decision to quit a high-paying executive position at Microsoft and start a non-profit to build libraries in the developing world. 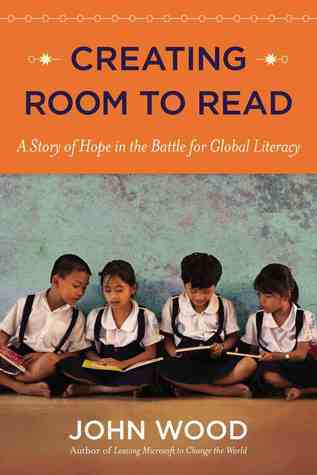 In the five years covered by Leaving Microsoft to Change the World, Room to Read grew from a tiny start up into a huge force for literacy and education in the developing world. Creating Room to Read is Wood’s update on the organization’s next stage, expanding to ten countries and opening 10 000 libraries in ten years, as well as their foray into the world of local language publishing, and the challenges of doing business on the African continent. Creating Room to Read is an update of Leaving Microsoft to Change the World, as well as a more articulate and substantial look at the organization’s work. Wood retreads enough ground that it isn’t necessary to have read his first book, but briefly enough not to bore those who have. The new book is harder hitting, examining several serious challenges the organization faced in this critical growth period. The first national director in South Africa was fired for misappropriating funds, an entrepreneur failed to deliver on his significant matching donation, and a five million dollar pledge was withdrawn in the aftermath of the 2008 financial crisis. Wood continues to show how he applied his business acumen to the organization’s challenges, but securely established as a philanthropist, there are far fewer Microsoft references in Creating Room to Read. Those with a particular interest in Wood’s connection to the technology giant will probably be more interested in Leaving Microsoft to Change the World. There is much less of Wood’s personal life in this book, though his relationship with his parents, and their involvement with Room to Read continue to figure prominently. Creating Room to Read revisits some of the people and places featured in Leaving Microsoft to Change the World, following up on the success of the first library in Bahundanda, Nepal, and Wood’s Vietnamese friend Vu, who Wood helped further his education before he ever dreamed of starting Room to Read. Both the revisitations, and the attention to Room to Read’s assessment and growth processes will be reassuring for readers who are looking to get to know the organization before making a donation or becoming involved in fundraising. Room to Read is not an organization content to rest on its laurels, and nor is a now seven year old book sufficient to tell the story of such an adaptive enterprise.